Dining Room Swag Curtains - Sew What? Sew Anything! 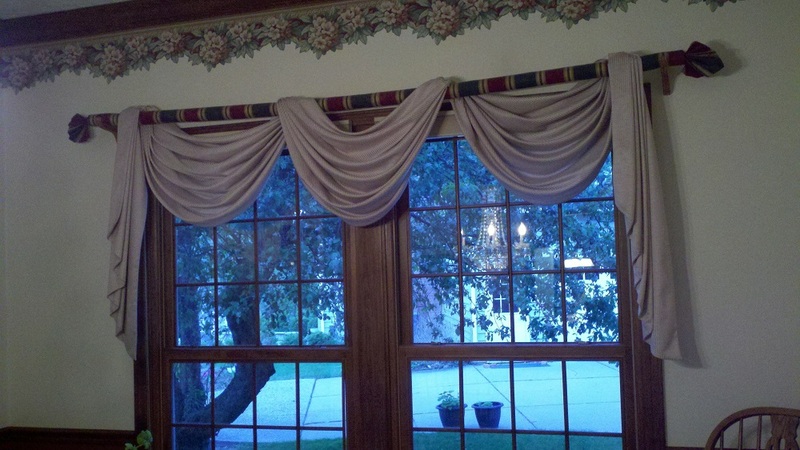 This swag valance serves to dramatically enhance the large window. A contrasting fabric was used to cover a PVC pipe to hang the swag and doubled as a curtain rod. This technique softens the look of the overall window treatment. This is a very formal look for a dining room. It also helps to hide the honeycomb shades which are mounted under the valance on the window. This installation demonstrates the use of several types of items to creatively achieve a functional and fashionable window treatment.